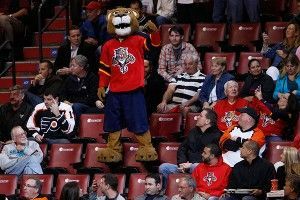 » You Can Do This, Florida Panthers! It’s been more than a decade since that Panthers postseason appearance, the longest active drought in hockey. (The Toronto Maple Leafs, who haven’t made the playoffs since 2004, are second on that dismal list.) But it looked as though it would be finally coming to an end — or at least getting a new beginning — on Tuesday night. The Panthers, who could clinch with a win over the Winnipeg Jets, certainly started off the game on track: Tomas Fleischmann’s goal just 25 seconds into the second period gave Florida a comfortable 3-0 lead. In a 10½-minute span that bridged the second and third periods, Winnipeg netted four unanswered goals, and the Panthers suddenly found themselves down 4-3. To the team’s credit, they managed to tie the game on a Tomas Kopecky snap shot and possibly could have won it had Winnipeg goalie Ondrej Pavelec not denied Fleischmann on a last-minute breakaway. But one point was all they could salvage: the game went into overtime, the Jets’ Andrew Ladd scored, and the Panthers lost 5-4. It was a glum birthday for Weiss, who turned 29 on Tuesday and had hoped to celebrate with a playoff berth. It would be particularly sweet for him: Drafted fourth overall by the Panthers in 2001, Weiss is the only player from the Panthers’ pre-lockout days to still be on the roster (David Booth had been the other, but he was traded to Vancouver earlier this season) after a series of trades and free agent signings by GM Dale Tallon, whom earlier this year I described as “a sugar-high kid in the Chuck E. Cheese prize room,” changed the complexion of the team completely. Florida’s ongoing playoff woes (or lack thereof, I guess) give Weiss, who is second on the team in points this season with 56, the unfortunate distinction among active players of having appeared in the second-most NHL regular season games without ever reaching the postseason. Only Jay Bouwmeester — a former Panther, natch — has played in more. I’d say he has a worse regular-season-to-playoff-game ratio, but you can’t divide by zero. Tuesday’s loss was depressing for the Panthers and their long-starved fans, whose delight at Florida’s unlikely and unexpected season has been dulled somewhat by the team’s play during the closing days. The Panthers are not exactly finishing with a flourish, having gone 3-2-5 in their last 10. “It’s hard to express the disappointment,” said coach Kevin Dineen, who like a great number of his players is in his first year with the Panthers. With two games to play, the Panthers need just one point (hey, their bread and butter!) to clinch the Southeast Division title and third-place seed in the East. One of those two games, though, is Thursday night against the Washington Capitals, who trail Florida by four points in the division but own the tiebreak. The Caps have won three of the five games between the two teams this season. If the Panthers do clinch, they’ll most likely face the New Jersey Devils — the same team Florida played in its last postseason appearance lo those many years ago. But it’s maybe not the most inspiring bookend: In that 2000 first-round series, the Panthers got swept.